FPT30 - GREEN plastic dump truck that has an attached wooden head driver wearing a yellow plastic construction hat. The truck has a WHITE plastic dump bed with black paper lithographs on the sides marked "Fisher-Price jiffy Dump Truck". The letters in the word "jiffy" are different colored. The truck rolls on 4 red balloon-type plastic wheels and is pulled by a yellow plastic hose with a squeeze bulb on the end. When child squeezes the bulb on the end of the pull cord, the dump bed tilts back to dump it's load and the attached driver turns his head to "look" from side to side. Measures 8-3/4" long, 5-1/2" wide and 4-3/4" high. FPT1231 - WHITE plastic dump truck that has an attached wooden head driver wearing a yellow plastic construction hat. 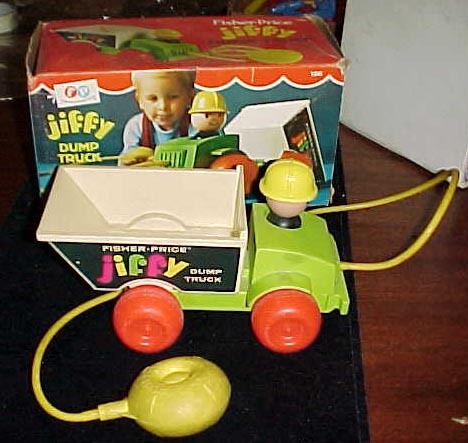 The truck has a GREEN plastic dump bed with black paper lithographs on the sides marked "Fisher-Price jiffy Dump Truck". The letters in the word "jiffy" are different colored. The truck rolls on 4 red balloon-type plastic wheels and is pulled by a yellow plastic hose with a squeeze bulb on the end. When child squeezes the bulb on the end of the pull cord, the dump bed tilts back to dump it's load and the attached driver turns his head to "look" from side to side. Measures 8-3/4" long, 5-1/2" wide and 4-3/4" high. Also see 1982's #151 Jiffy Dump Truck for a same size truck, but different colored.